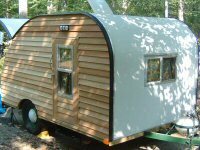 Teardrops n Tiny Travel Trailers • View topic - Bed Liner as an exterior coating? Bed Liner as an exterior coating? 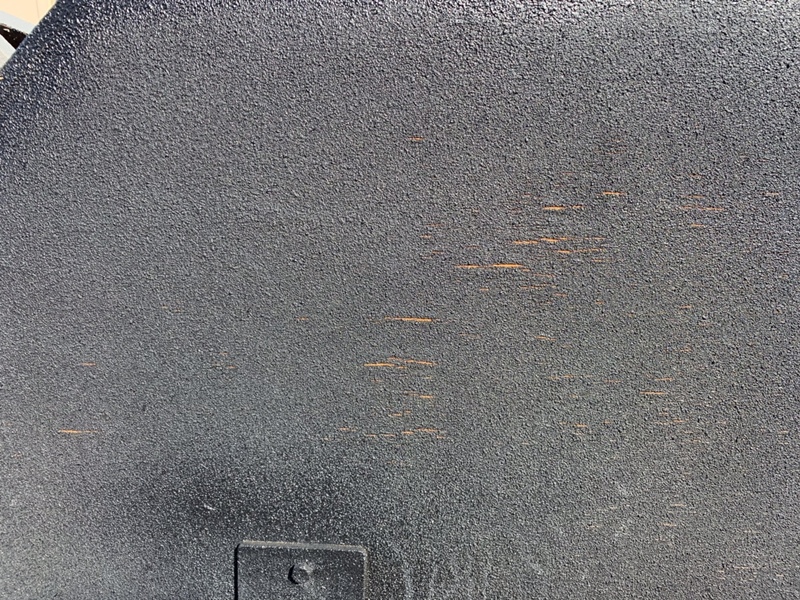 Re: Bed Liner as an exterior coating? Thanks, I book marked the link. I've got a leak I haven't been able to fix, I'm leaning toward using this. Bedliner isn't that heavy, especially considering how much plywood is used in most builds and how heavy it is. Its going to be vastly more durable than any other finish you can do over luan. You can seal the ends of all your walls and joints with it and eliminate any chance of your luan getting wet and delaminating. Not even in the same category as bedsheets and house paint and only slightly heavier. 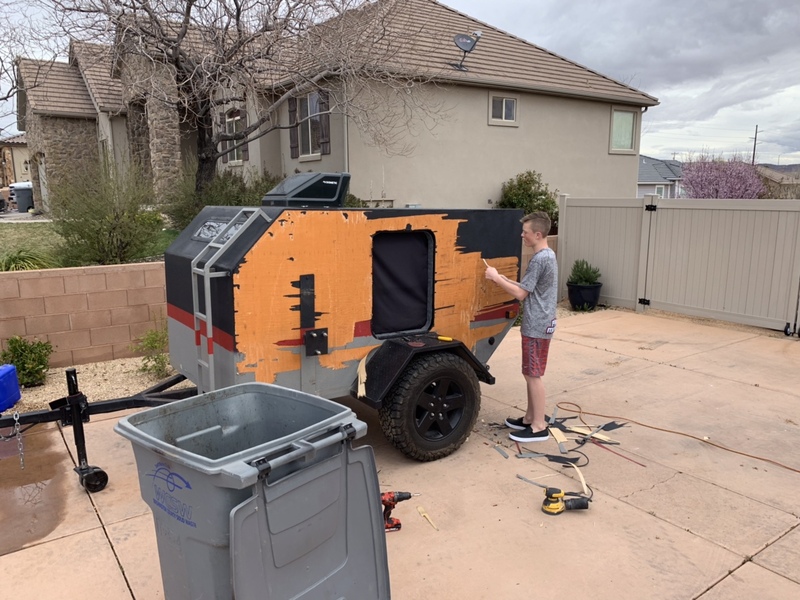 If done right, it will never peel or crack and will probably outlive the rest of your camper. Also, if you get dust on it, you can wash it. It will fade or haze a little unless you cover it with a UV stable paint or clearcoat, but will add an extra layer of strength and protection that nothing else will. Just my 2 cents worth though. "Aluminum skinning is to cover rotting prone crappy plywood"
Gator417 wrote: Not even in the same category as bedsheets and house paint and only slightly heavier. Not "bedsheets and house paint" but the sample I made of 10oz canvas and TB2 glue (PMF) came to ~.15 lb/sq ft. Monstaliner is about the same weight, maybe a little less. But this is used as a structural material over foam not just a coating. Bedliner must be very good for abrasion, but the Monstaliner pieces I got will tear more easily than the PMF, which makes sense. It's designed to have a hard substrate, not to be a structural layer. I don't know if it's a good idea to use plywood (especially non marine ply) as an outer skin (implying sandwich construction), regardless of the coating. Too many reports of eventual water leakage and rot. Even if you eliminate seams, there are going to be screws and other places where water can get in. Also some speculation here that an oil based ploy and solvent sealer may have dissolved the glue of the luan: viewtopic.php?f=2&t=49207 So you need to be careful what you use! 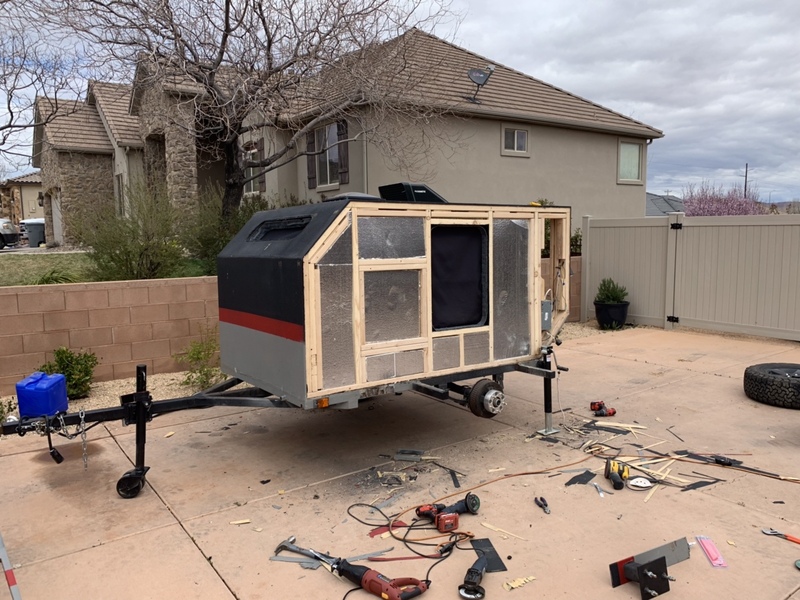 I agree that plywood is a bad choice to skin a camper. Apparently, so does the camper manufacturing industry. I don't even think its a good choice to use inside because it can so easily be compromised, even with just high humidity, especially when subjected to a lot of vibration and movement. Worse yet, sometimes it won't show any signs of damage until its really bad. Also, full disclosure, I used to work at the local Line-X dealership. Its the only spray on liner I've got real experience with & I may be a little prejudiced towards it. 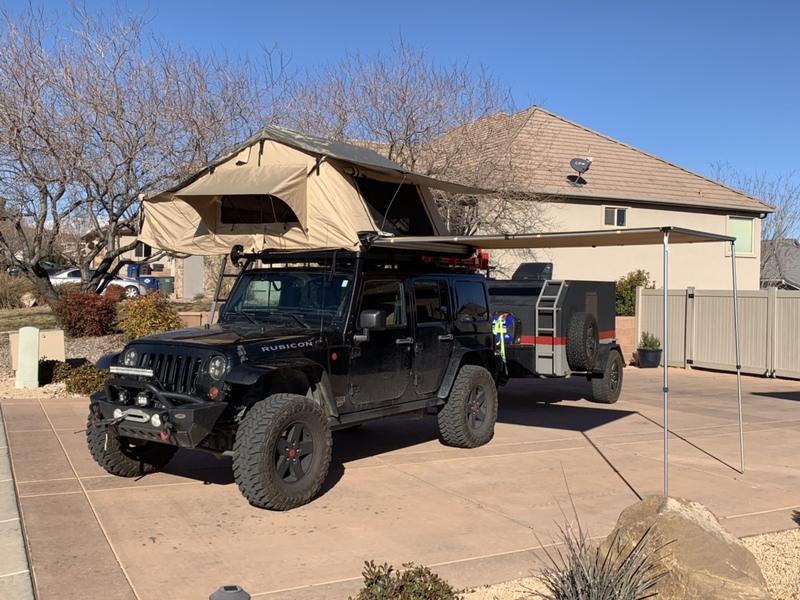 We did a lot of other things like boat decks, motorcycle frames (mine, love it), rims, rocker panels/fenders, gunstocks (mine, love it), pop-up camper roofs, industrial equipment, cell phone cases, boots and the owner's Jeep. We also did the bottoms of all the plywood booths used in the remodeled Chili's restaurants. I can't speak for all of them, but Line-X is extremely tough stuff. It would add a great deal of impact, abraision and weather resistance, and look really neat. My Goldwing gets tons of compliments on the finish. 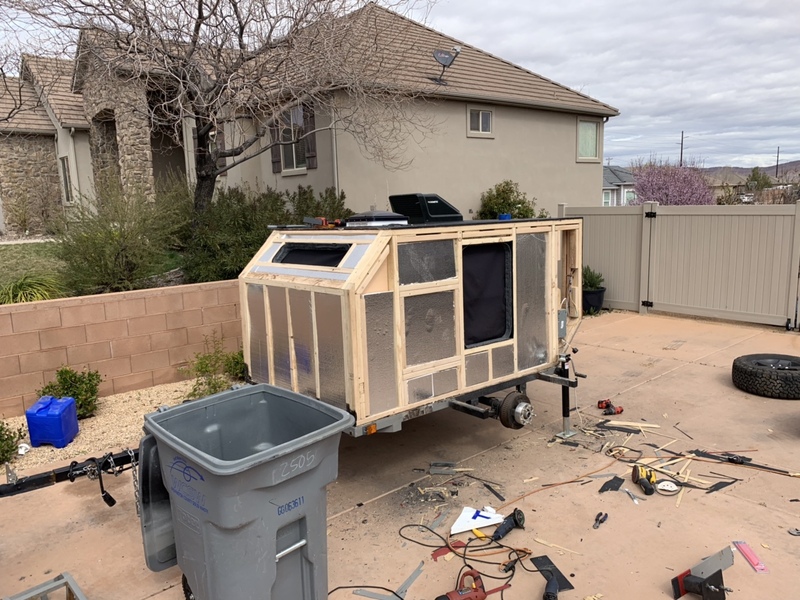 I am very interested and thinking on getting my little guy 6 wide bed lined.i think I will like the look of it, but also the idea of completely sealing my exterior is very appealing. I have worked out a price that i am comfortable with. I am going with rhinoliner. I am also thinking on going with black. The folks say that the Bed liner it's self, stays cool to the touch. But would it still heat the inside? Can anyone with a black exterior chime in on heat from a black shell?.. any regrets bed lining it after it was done? Or any thoughts would be great. Do you have any build journals? paulnb57 wrote: Anyone used Upol Raptor truck bed liner as an exterior coating on a wooden skin? Looks great doesn’t it? The stuff is hard as a rock and doesn’t have “any” flexibility. Now had I treated the wood properly before hand and made it waterproof I may not be showing you this. But I regret how I used it in my application for sure. Good that you recognized the signs of degradation and took immediate steps to prevent bigger problems from beginning. Seems like hard work now, but if you had let it go and rot started in, it could have been much worse. With those clean studs and unglued insulation the job doesn't look half bad (from my house, anyway ).